Last September, I went to Japan to attend my little brother’s graduation. I was so excited because I thought it would be full autumn there with its yellow and orange trees. But it’s not autumn yet, people. 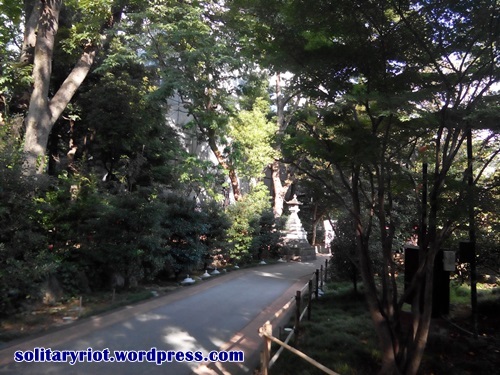 It’s still a transition from summer to autumn, and sometimes the weather was still hot. I had to abort my mission to take a dramatic selfie with a setting of fallen leaves. 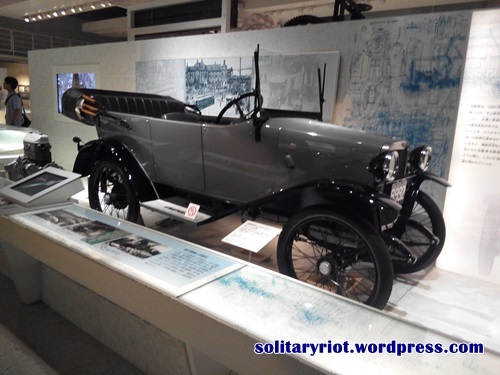 This time I went with mom, and my brother and I decided that we would take her to places that show the two sides of Tokyo, the metropolitan and the traditional. 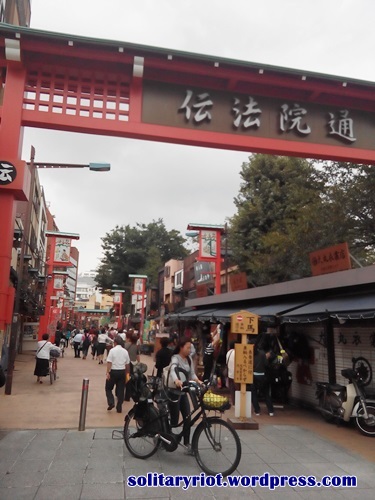 We included Shibuya, Harajuku, Asakusa, Ueno and Yokohama to our itinerary. Our flight was at 9.30 PM from Soekarno Hatta. 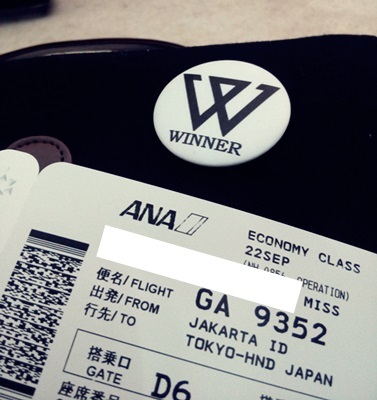 Actually I booked our tickets via Garuda Indonesia website, but then we flew with ANA, Garuda’s partner. The flight attendants were really nice and helpful, but to be honest, I still prefer to fly with Garuda because the food is more of my taste. Anyway, the flight was hella bumpy I couldn’t sleep! I kept holding my mom’s hand and kept reciting any prayer that I could remember at that time. It was that terrifying. And when I was being really anxious, I looked to my left and found the woman next to me was peacefully sleeping. Even snoring … Thankfully, the plane landed safely in Haneda, earlier than the schedule in fact! Without any problem, we passed the immigration and customs. After my brother and his wife came to pick us up, we took the train to their apato in Kita-Ayase, around an hour from Haneda. 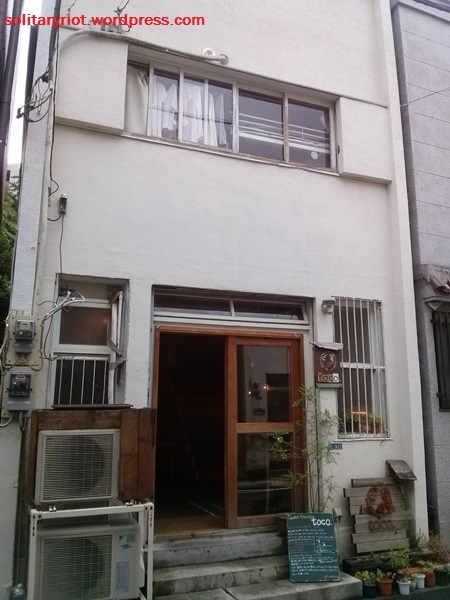 My bro’s apato was in the suburb of Tokyo, so it’s still kinda quiet. 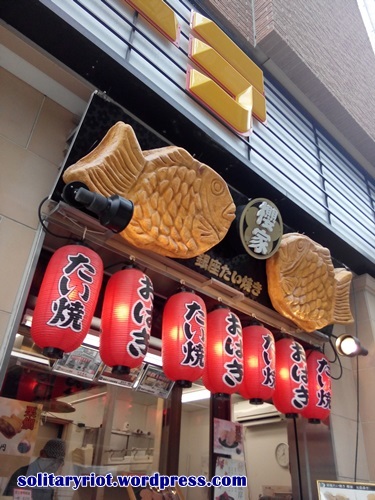 In front of it there’s Big A supermarket and it’s only ten minute walk from Kita-Ayase station. Everyday we walked to and fro the station, and although it felt heavy at first, we later felt the good effects for our health. Arriving there, we decided to have lunch first while waiting for the courier to deliver my pre-ordered modem. Based on a friend’s recommendation, I rented a modem from Pupuru. 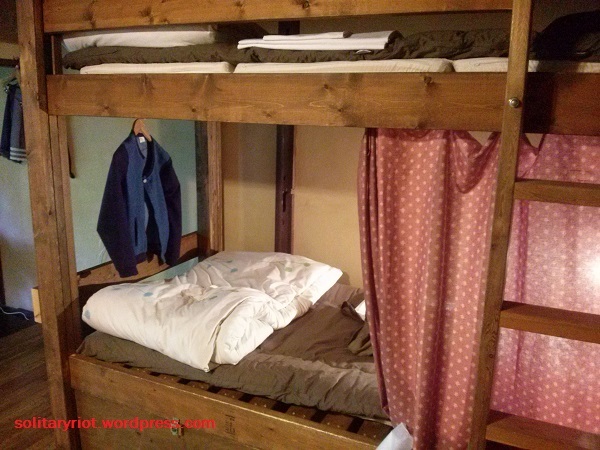 Actually wi-fi was provided in the apato but I knew we would go out a lot, so I chose to rent with the cost of 400 JPY per day. At eleven, the courier came, right on time. Later, I just had to put the modem and its charger into a provided envelope and put it into a post box. Even though we’re still worn out due to lack of sleep, after lunch we went straight to Omotesando (I like the atmosphere here but the stores are not for my wallet apparently). 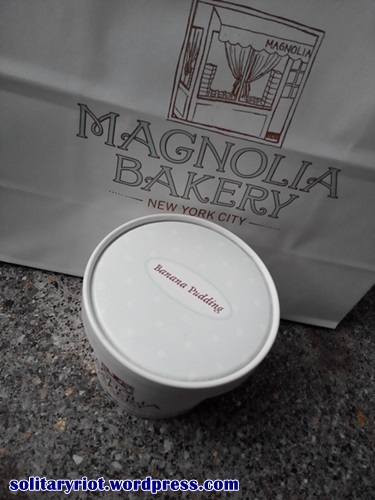 My main destination is Magnolia Bakery in GYRE (the nearest station is Meiji-jingumae Station). The store isn’t big but when we came it’s quite packed. I really wanted to go there because I’d like to taste the famous banana pudding. And it’s worth it! Though it looks messy, it is soooo scrumptious. A kind of delicious that will last long in your mouth. Its combination of biscuit, creme, vanilla and bits of banana is just right. It’s too good I don’t even know how to describe it! The price is 660 JPY for the small size and 880 JPY for the large one. Pricey indeed, but if you like banana flavoured sweets, it’s a must try. A green spot in Harajuku. Afterward, we walked to Harajuku since my mom and sister in law wanted to check Daiso and the branch there is big. Because it’s public holiday, Harajuku was freaking crowded. 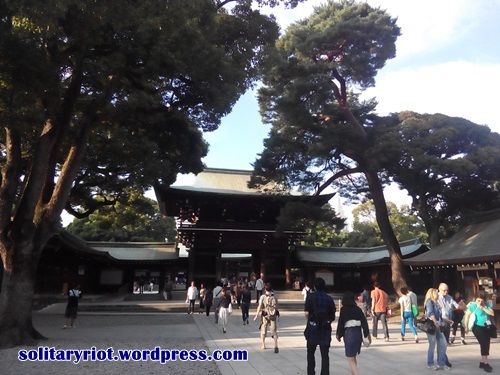 We didn’t stay long there and headed to Meiji Jingu shrine in Shibuya. It’s located inside a park, 20 minutes from the gate. 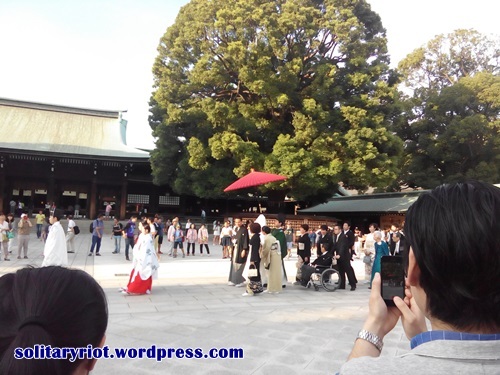 What a coincidence by the time we arrived there was a wedding procession going on. As the day was getting darker, we made our last stop in Shibuya. Of course I must visit Tower Records! 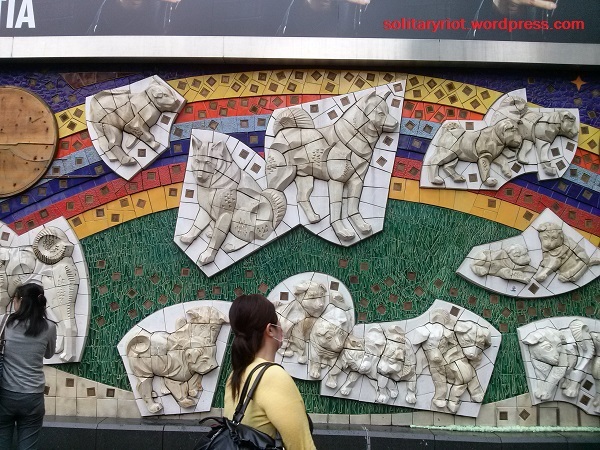 We also showed Hachiko and the famous Shibuya crossing to mom. 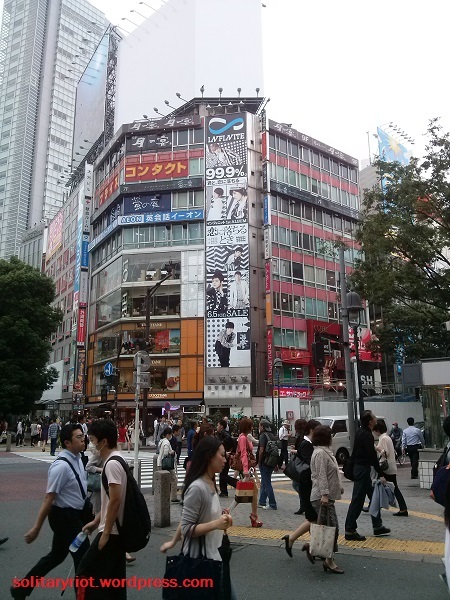 Probably some of you who have visited Tokyo a couple of times are already bored with Shibuya, but not me. I always love the vibe of the area. 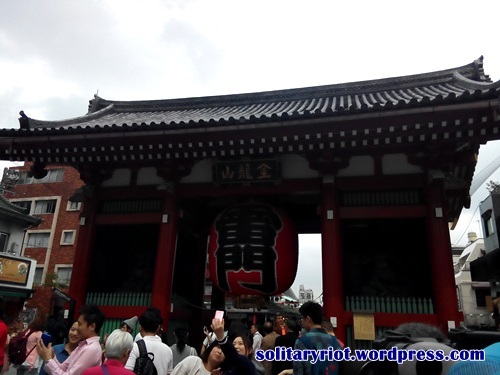 We continued our journey to Ueno Park! Unfortunately the museum I wanted to visit, National Museum of Western Art, was closed for renovation or something. 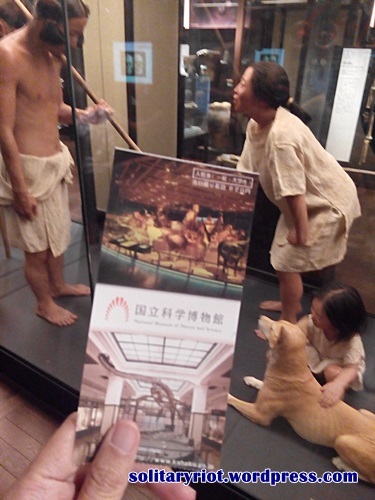 So I decided to join my family to National Museum of Science and Nature. 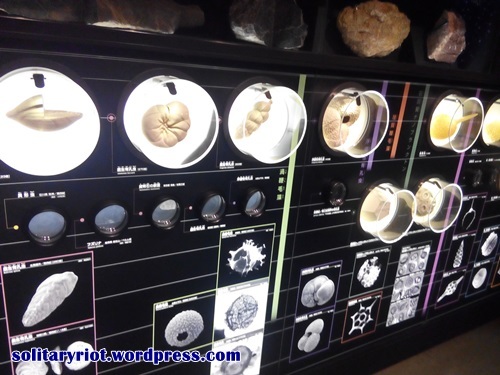 To be frank, I wasn’t really impressed by the science part, but the nature part was alright. 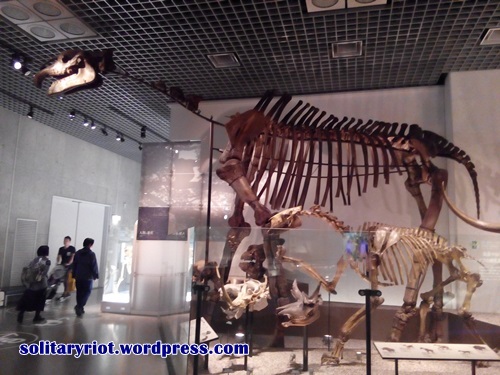 The museum is divided into two main buildings, the Japanese collection and the international collection. I personally enjoyed the Japanese collection more, even though it’s quiet there and kinda creepy. When we went out of the museum, it’s drizzling so we directly headed home. 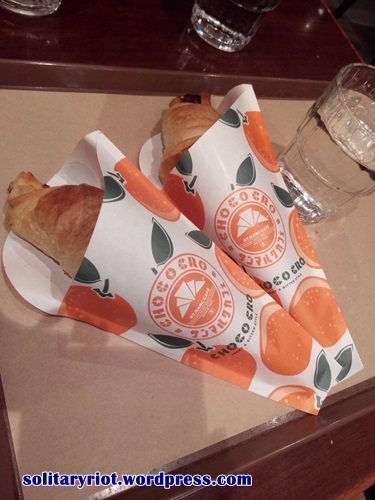 Oh, but we stopped at Chococro at Kitasenju station to get some croissant and milk tea. The choco-orange croissant was the bomb. Also, finally tasted it for the first time and instantly in love. 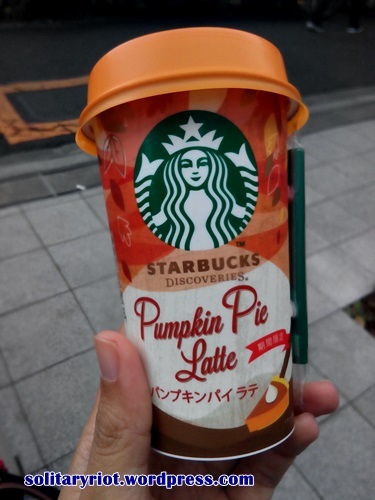 It’s the best thing ever from Starbucks! 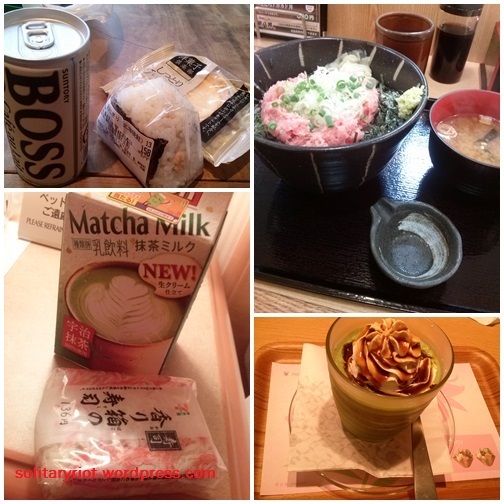 Categories: travel notes | Tags: Tokyo, traveling, Trip | Permalink. Spent my last weekend in Bangkok and it’s fun, as always. In my previous trips to the city, I visited the tourist spots like the Grand Palace and Chatucak market, so this time I decided to just stroll around, following where my feet go. And it turned out that the feet wanted to go to places where there are good food and books teehee. Not in the mood to share space with others, I booked a single room in Ds67 Suites. 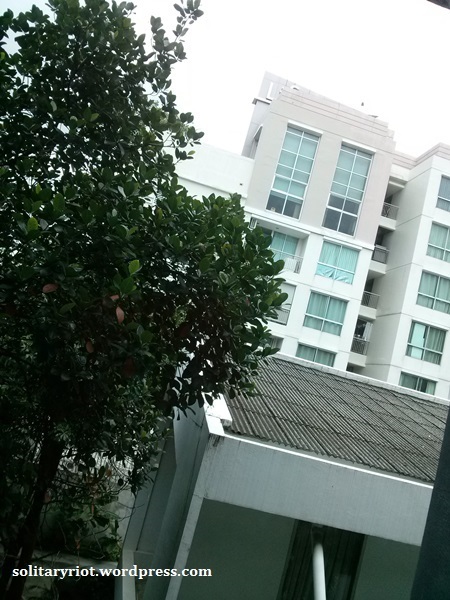 Ds67 Suites is located in Sukhumvit Soi 67, only a few steps away from Phra Kanong BTS station. I can’t really remember how I found this place, probably from Booking.com, but I booked the room via their official website. The hotel is very nice! My room is spacey for one person, and the bed is actually big enough for two people! Also, the bathroom is clean, which is very important to me. The bed. Although it’s comfy, I kinda wish they provided a bigger pillow. In every room, they decorated the wall with Thai-themed art. There’s TV (only ten channels but that doesn’t really matter to me) and a fridge. The bathroom. The water heater works well, maybe too well hahaha. The view from my room. I have no idea what that building is, probably an apartment. Stupid me for not taking pictures of the cafe of the hotel! Yes, they do have a small cafe in the hotel, and its decoration is very cute. Sadly, I didn’t have the chance to spend time in it because they closed at 6 PM. Had breakfast at Cafe Bicycle. 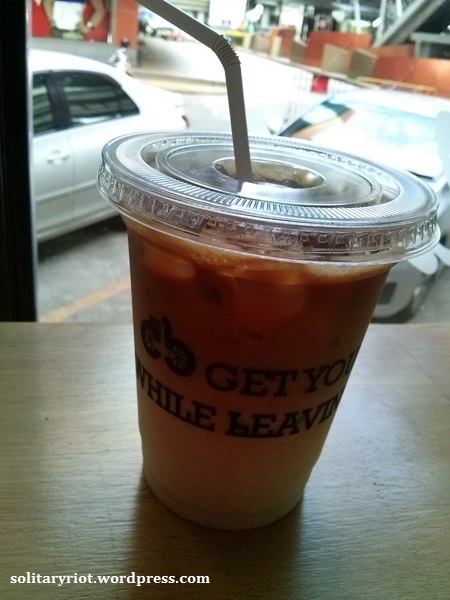 Someone recommended on the net, and since it’s still in Sukhumvit line, I decided to try it. 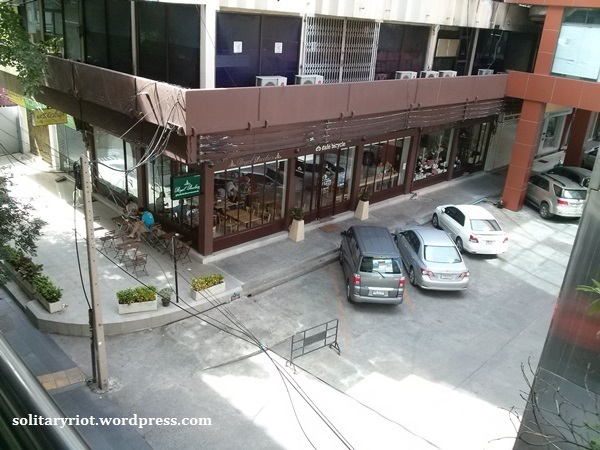 Cafe Bicycle is in Mahatun Plaza, next to Phloen Cit station. Take exit 2 and 4 and you can already see the comfy cafe. 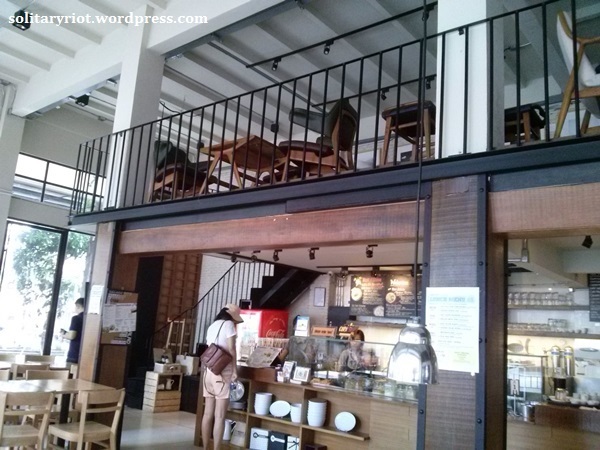 I love how the cafe has high ceiling and big windows. A nice place to start your morning! I ordered Smoked Salmon Omelette. It comes with salad and wheat bread toasts, as you can see there. I think the salad dressing is home-made? Was it good? VERY. 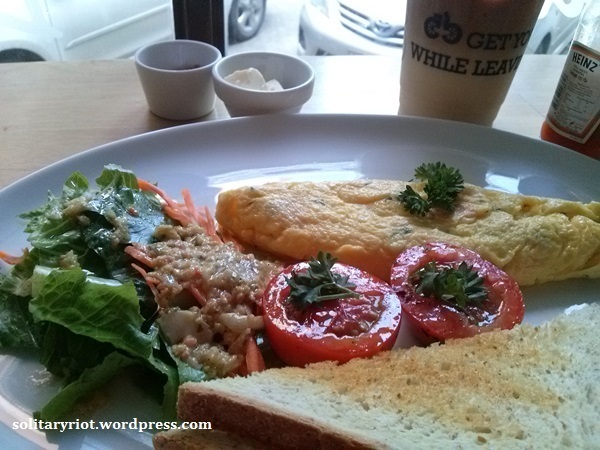 With its delicious food and coffee and its comfortable ambiance, I’ll definitely visit this place again on my next Bangkok trip and stay longer! 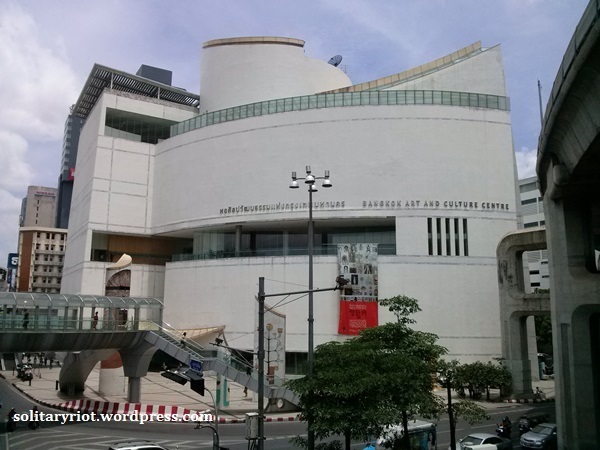 Besides going to Siam Paragon for a necessary visit to its big branch of Kinokuniya, I also went to Bangkok Art and Culture Centre. It’s between MBK and Siam Discovery, so when you alight at National Stadium station, you can visit those three places. Inside Bangkok Art and Culture Centre you’ll find many art and design shops and some chich coffee shops. They also have a cinema and several galleries. This place is a must if you’re eager to know about Thai contemporary art and design. 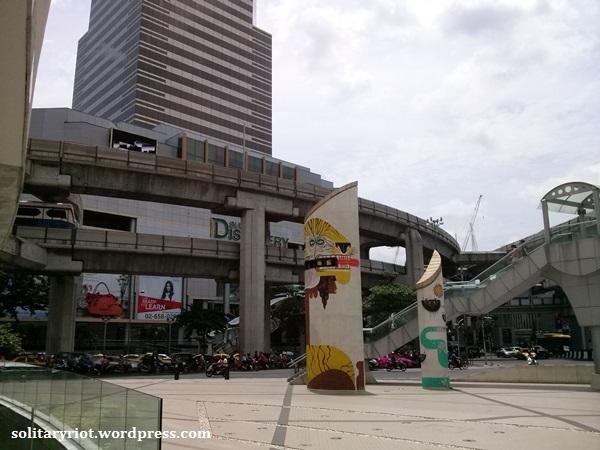 Going out from Bangkok Art and Culture Centre, you can see Siam Discovery there. Just walk along the sky bridge and voila, you’re in one of the hip malls in Bangkok. 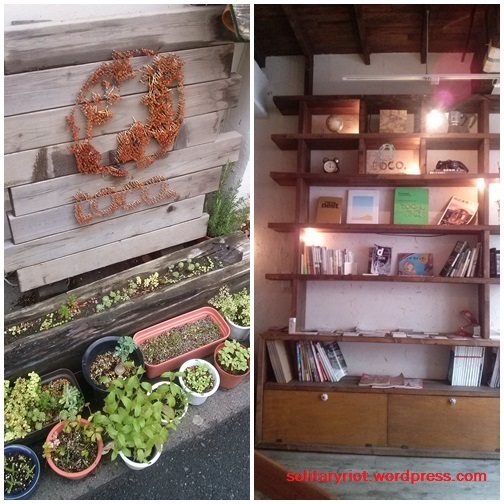 The place that interests me the most is Loft, a two-storey stationary shop. IT IS HEAVEN. I thought Be Trend in Siam Paragon is the best stationary heaven in Bangkok, but stepping inside Loft, I think I lost my mind there lol. Despite my friend’s warning that it’d be very hot, I found the weather was still tolerable. There wasn’t much raining as well, only some drizzle. Bangkok never fails me, really. It always offers me something new to look at, something fresh to taste. Categories: travel notes | Tags: Bangkok, holiday, Thailand, Trip | Permalink. Tadinya, gak kepikir sama sekali untuk ke Jepang tahun ini karena Januari lalu kan gue udah ke Hong Kong (berarti target gue untuk satu negara baru tiap tahun sudah terpenuhi sebenarnya). Tapi kemudian ketika seorang temen dari Filipina bilang kalo doi punya tiket ekstra untuk konser Tohoshinki di Tokyo Dome, langsung lah gue bilang gue mau. Akhirnya pergi deh ke Jepang. Awalnya sempet was-was, takut uangnya gak cukup, takut gak dapet visa. Alhamdulillah semua kekhawatiran gak terbukti. Dapetin visa Jepang ternyata gak sesukar yang dibayangkan. 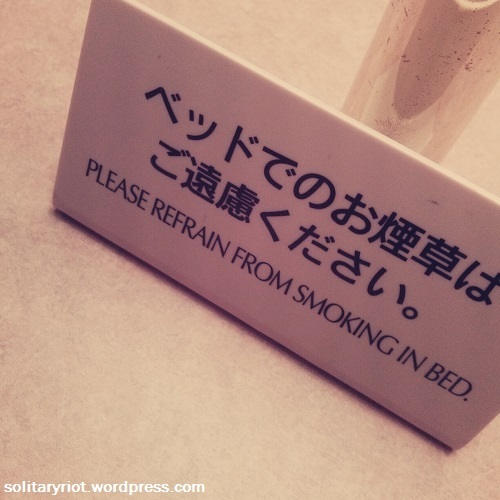 Walau cuma empat hari (karena hari pertama bener-bener abis di jalan) dan cuma di Tokyo, gue menikmati waktu gue di Jepang. Gue berangkat Kamis pagi tanggal 13 Juni. Jam setengah sepuluh-an udah sampe di LCCT padahal pesawat ke Tokyo baru berangkat nanti jam setengah tiga siang. Alhasil harus nunggu selama sekitar lima jam di bandara yang gak terlalu besar ini. Nothing to see basically. Ngapain aja ya gue? Berusaha untuk baca novel, tapi setelah dua bab berhenti. Kemudian minum kopi, makan kue dan dimsum, browsing berkat wi-fi gratis dan corat-coret di travel logbook Moomin yang selalu gue bawa. Then the next flight to Tokyo took about seven hours. Tujuh jam, gimana bokong gue gak tambah ceper hahaha. Anyway, setelah makan (lagi), corat-coret (lagi) dan ngeliatin berbagai orang di sekitar gue, tujuh jam pun terlewati. Akhirnya mendarat di Tokyo! Walau menghabiskan waktu lebih dari dua belas jam di jalan, badan langsung seger lagi dong begitu menginjakkan kaki di Haneda. Setelah melewati imigrasi dan pemeriksaan bea cukai, rasanya pengen lari-lari keliling bandara saking senengnya. Norak memang, tapi masih gak percaya kalau gue sampe di Jepang 😀 Tambah seneng lagi pas liat adek gue udah jemput. Yep, yang bikin kekhawatiran gue berkurang selama di Tokyo adalah karena adek gue memang lagi kuliah di sana. He taught me about many things to survive in Tokyo. 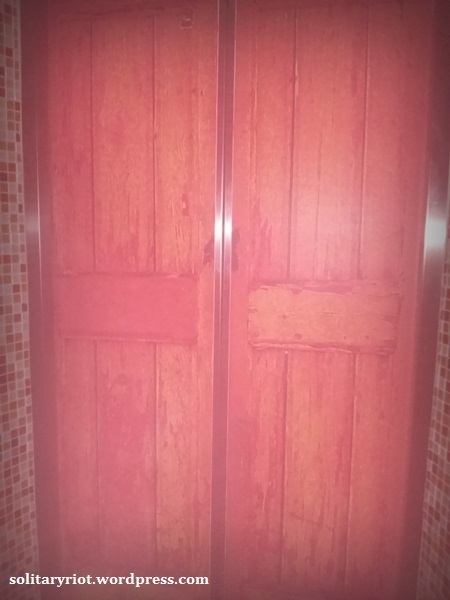 Termasuk penggunaan toilet canggih mereka. Silly but true, saking canggihnya gue sempet rada bingung tombol mana yang harus ditekan hahaha. 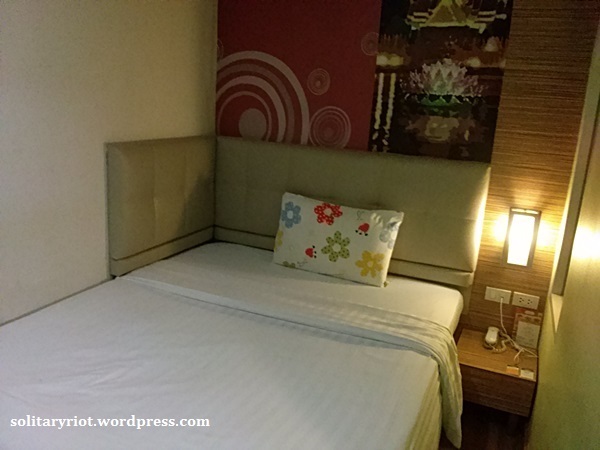 Malam itu gue dan adek gue memutuskan untuk nginep di Toyoko Inn, di salah satu cabangnya yang lumayan deket dari Haneda. Mereka juga menyediakan free shuttle bus dari bandara, jadi gak harus naik taksi yang katanya mahal itu. 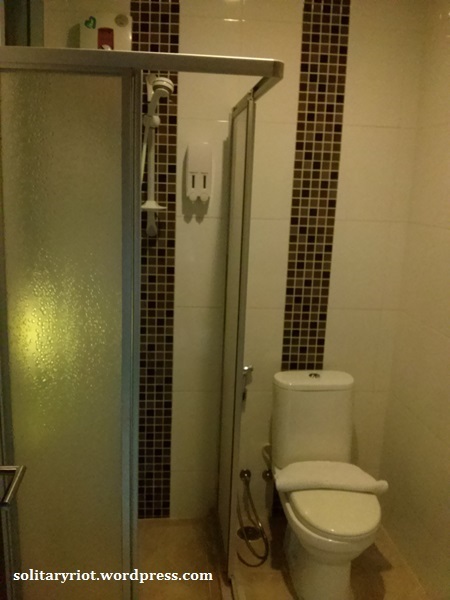 Kamar twin-nya lumayan, dan fasilitas kayak kulkas, piyama dan hair-dryer ada. Dapet sarapan juga, kalo di Toyoko Inn 1 menyediakan sarapan ala Jepang, kalo di Toyoko Inn 2 sarapan ala Barat. Pas di seberang hotel juga ada Family Mart, where you can always go for cheap meals teehee. 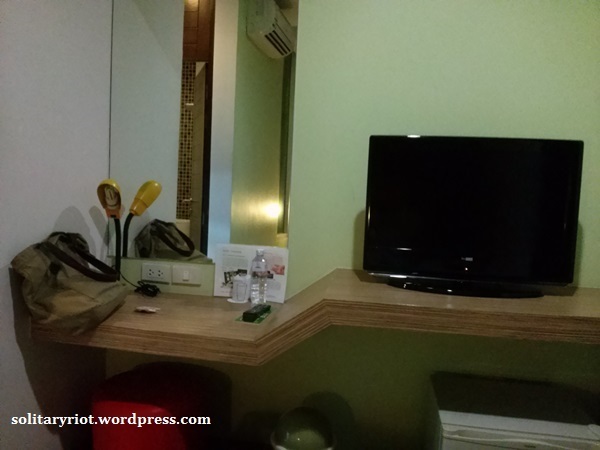 Oh iya, hotel ini juga cuma berjarak beberapa langkah dari stasiun Otorii. Besoknya kami udah harus check-out dari hotel dan karena check in di hostel baru nanti jam empat, gue minta diantar ke Shibuya. Tujuannya? Tower Records dong 😀 Dan akhirnya bisa menyaksikan sendiri riwehnya ketika seabrek orang menyebrang ke sana ke mari di lampu merah Shibuya. Things even got even more dramatic because at that time it was drizzling and people were using their transparent umbrellas. It reminds me of a movie scene. Sesampainya di Tower Records, kami langsung disambut sama MV-nya Infinite. Ternyata Infinite baru rilis album Jepang mereka. Pantesan poster dan CD mereka menuhin seisi toko. Kalau gak inget gue cuma bawa koper ukuran sedang (dan inget isi dompet tentunya), mungkin gue udah menggila di Tower Records hahaha. Setelah beli beberapa CD titipan temen dan DVD, akhirnya gue dan adek gue mutusin untuk cari tempat ngopi. Di Tower Records sebenarnya ada cafe juga, tapi kayaknya harganya di atas rata-rata. Akhirnya kami pun ngopi di sebuah cafe ala Prancis di Shibuya Marks. Sambil nunggu adek gue sholat Jumat di sebuah musholla mini yang sebenarnya ruangan apartemen di sekitar situ, gue mutusin muter-muter di Tsutaya, toko CD dan rental DVD juga. Di sini CD artis Jepang lebih lengkap kayaknya? Setelahnya, baru kami makan siang di Sukiya. Menunya mirip sama Yoshinoya, but they have beef bowl with cheese, yayyy! Pemandangan di halaman belakangnya. Pengurusnya bilang kalo beberapa batu dibawa dari gunung Fuji. Kalau pagi-pagi enak banget duduk-duduk di sini, walau lumayan banyak nyamuk karena sudah masuk musim panas. Gue nginep di dorm khusus cewek, semalamnya 3,000 yen atau sekitar 300 ribu rupiah. Lumayan lah ya untuk ukuran Tokyo. And here’s my bunk, maaf masih berantakan karena sepreinya belum dipasang. Pas gue ke sana, ke-enam bunk terisi penuh. Penghuni lain asalnya dari Jepang, Korea (who was the nicest) dan juga Singapura. Ini pertama kali gue nginep di dorm campur sama orang asing. Awalnya agak jengah sih, tapi lama-lama ya santai aja. Pelajaran baru tentang toleransi. I had a great time staying there. Pengurusnya baik-baik dan bisa berkomunikasi dengan bahasa Inggris dengan lancar. Letaknya juga strategis, deket stasiun Iriya dan Uguisudani dan beberapa convenience store. Gue juga milih hostel ini karena hanya berjarak sekitar lima stasiun dari Tokyo Dome. Buat yang suka minum, kalo malem lobby hostel ini berubah jadi bar kecil. Sorenya, gue jalan-jalan sendirian karena adek gue ada urusan di kampus. Gue memutuskan untuk ke Ueno karena (menurut peta) jaraknya yang deket dari hostel. Tapi ternyata pas dijabanin jalan kaki cape ya boooooo. Ueno itu mungkin kayak Blok M ya. Seru sih, dan gue nemu toko yang jual alat tulis yang lucu-lucu. Pas hari terakhir gue juga nemu restoran tempura enak banget di sini. Hari konsernya, dan otomatis gue menghabiskan banyak waktu di Tokyo Dome City-nya (mengenai konsernya sudah dibahas di blog lain ya, ahem). Tokyo Dome City itu komplek hiburan untuk semua umur sebenarnya. Selain ada Tokyo Dome-nya, juga ada mal, deretan restoran dan taman hiburan. Yang suka One Piece dan Naruto pasti seneng banget karena ada toko khusus majalah Jump. Karena konser baru dimulai nanti jam enam, gue diajak adek gue ke kampus dia, Tokyo University. Kata dia sih bisa dicapai dengan berjalan kaki dari Tokyo Dome. Emang bisa dicapai siiiiiih, tapi capenya gak kira-kira. Konser belum mulai aja kaki gue udah mau copot >< But we had great lunch! Kali ini gue diajak makan di restoran nasi-nasian lagi, tapi dengan lauk ikan mentah atau hidangan laut lainnya. Gue mesen nasi dengan ikan tuna mentah dan taburan rumput laut di atasnya. Jauh dari amis, ikannya seger banget! Berbagai makanan yang gue cicipin pas di Tokyo. Bahkan makanan di konbini-nya sukses bikin gue ngiler hahaha. 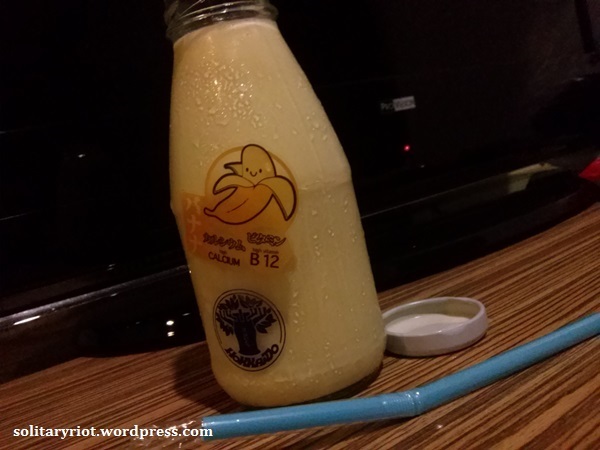 Yang di pojok bawah itu green tea frappucino with brown sauce cream (kayak gula jawa sebenarnya) dari cafe Nana yang menyediakan berbagai olahan teh hijau. Salah satu cabangnya ada di Ueno. 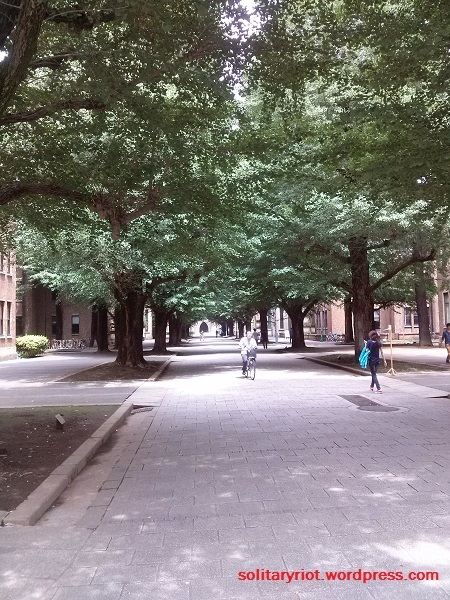 Setelah makan siang, gue pun memutuskan untuk mampir ke Tokyo University dulu. Gedung-gedungnya banyak yang kuno, agak mengingatkan gue sama ITB. Yang bikin nyaman adalah pohon ada di mana-mana, and in summer, they’re green and lush. Bicara musim panas, hari itu lagi panas banget. Dan salahnya gue lagi pake kemeja flanel, makin mantap lah itu kegerahan. But it was fun, the heat that I will always remember lol. 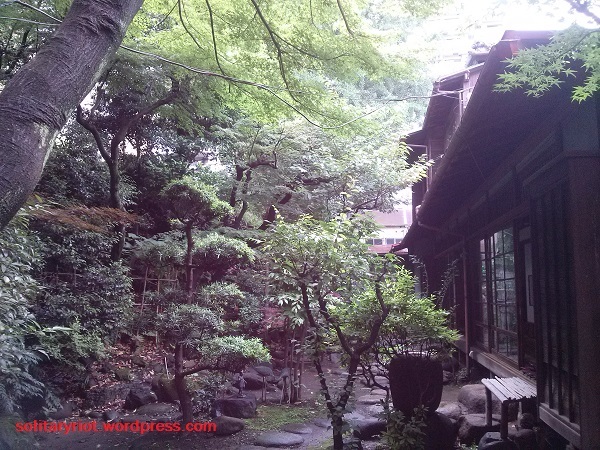 Categories: bits of life, travel notes | Tags: Japan, Tokyo, Trip | Permalink.